It's a food fight, with two of the biggest chicken producers battling to chow down on breakfast sausages. Tyson Foods made a $6.2 billion offer on Thursday for Hillshire Brands, the maker of Jimmy Dean sausages and Ball Park hot dogs. Tyson's offer came two days after rival chicken processor Pilgrim's Pride made a $5.58 billion bid for Hillshire. In the meantime, Hillshire itself has been trying to buy Birds Eye frozen vegetables maker Pinnacle Foods for $4.23 billion. The latest offer by Tyson sent Hillshire shares up 15 percent on Thursday. Tyson, one of the world's largest meat producers, is offering $50 per share - $5 per share higher than the Pilgrim's Pride offer. Hillshire has about 124 million shares outstanding, according to SEC filings. 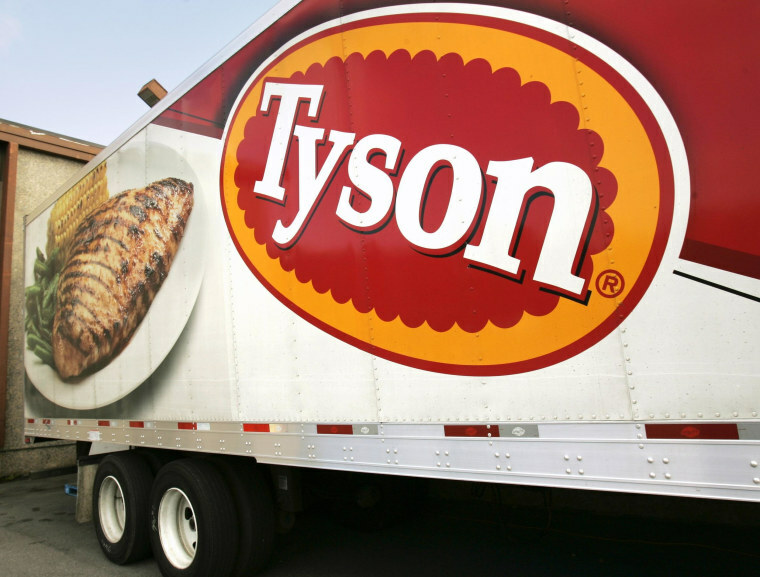 Tyson said its offer would make a more profitable company and a "clear leader" in the retail sale of prepared foods. "We believe that there is a strong strategic, financial and operational rationale for the combination of Tyson and Hillshire," said Tyson CEO Donnie Smith. The offer is a 35-percent premium to Hillshire's closing price May 9, the day before Hillshire announced its bid for Pinnacle. Hillshire said earlier it strongly believes in its deal with Pinnacle Foods but was reviewing Pilgrim Pride's $5.58 billion offer. Hillshire had no immediate comment on the Tyson offer.